Beacon Hill stands on the eastern edge of the Griffith Park as the easternmost summit of the 40-mile long Santa Monica Mountain Range, dropping off steeply into the Los Angeles River. At only 1,001 feet in evaluation, Beacon Hill does not compare to the park's taller neighbors to the west, but it rewards you with stunning clear-day views of the urban sprawl we call Glendale, Burbank, and Eagle Rock. The peak gets its name from the beacon that used to stand on its summit guiding aircraft flying in and out of nearby Grand Central Air Terminal in Glendale. The airport got its start in 1923 and was the Southland's main air terminal. It played a vital part in the fledgling aviation industry. Such legendary aviation figures as Jack Northrop, Howard Hughes, William Boeing, Amelia Earhart, and Charles Lindbergh were associated with the airport. After the U.S. entered WWII, the airport was turned into a P-38 fighter base. After the war the airport ceased operating as commercial terminal. The airport finally closed in 1959. 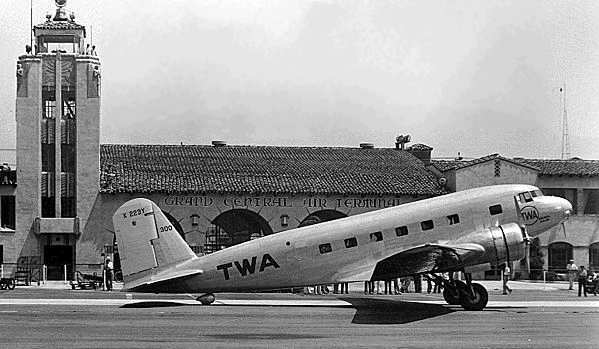 The historic terminal building, built in 1928, still stands at 1310 Air Way in Glendale. Grand Avenue between Sonora and Grandview avenues travels over the location of the old runway. The beacon on Beacon Hill would have also been of assistance to the flyers at the Griffith airfield. Built by Van Griffith (son of Col. Griffith), the Griffith Aviation Park opened on May 12, 1912. It was located on the west side of the Los Angeles River in the area which is now the Zoo parking lot, the interchange of the I-5 and 134 freeways, and the John Ferraro Soccer Fields. Glenn Martin operated an aircraft factory and flying school on the site in the early years. Two of aviation's biggest names got their start there. William Boeing was one of Martin's students and Donald Douglas was an engineer. The site fell into disuse after Martin left in 1916. In 1925 the California National Guard established the Griffith airfield as a base for its 115th Observation Squadron, 40th Division Air Service. Led by Major Corliss C. Moseley, the outfit occupied the site until 1941. 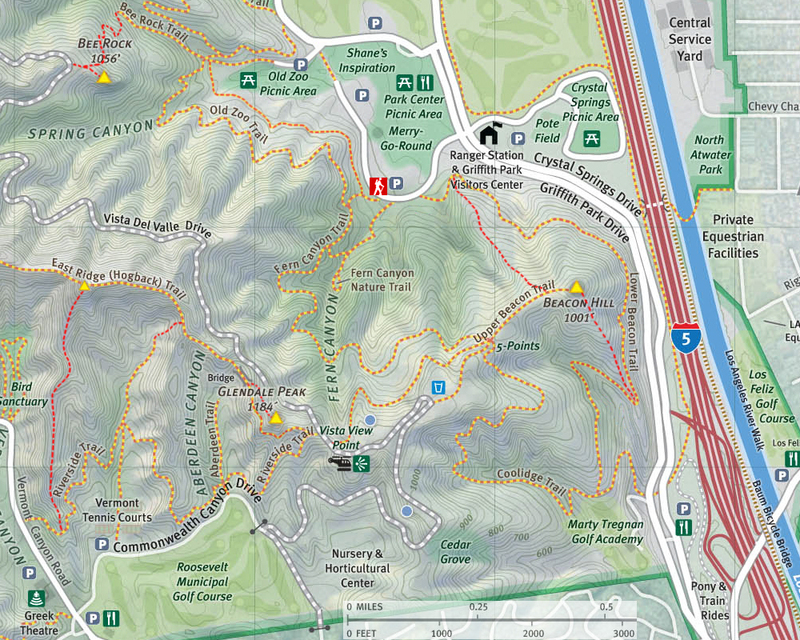 This loop hike starts at the big parking lot next to the merry-go-round, takes you up Fern Canyon Trail to Beacon Hill, then returns via Coolidge Trail and Lower Beacon Trail, giving you a nice tour of the southeast corner of the park. This area burned in the May 2007 fire, but the vegetation is coming back quite well and offers a pleasant outing. If you prefer a shorter hike, you can go up and back via Fern Canyon Trial, making it 2.5 miles round trip. If you want a longer trek, you can add a west-view loop making your total trip 5.0 miles. You can also climb the use path ascending the north ridge to Beacon Hill, saving about one mile. From the large parking lot near the merry-go-round, walk back south to the entrance of the lot. (Note at this point, a barrier and gate blocks the road from vehicles traveling any further.) Directly across the road is the beginning to Lower Beacon Trail, which is where you will come out if you are hiking the whole loop. It's also where you will start if you are climbing the north ridge route. But for the stalk hike, turn right, passing the road barricade and walk about 75 yards up the paved road and notice a trail on your left heading up the canyon. This is Fern Canyon Nature Trail. Walk another 50 yards and see a dirt road veering to the left (the paved road bends around to the right). This is Fern Canyon Trail. Take this trail. In about 80 yards, ignore the first trail on the right (this is the trail to Old Zoo Picnic Area). In another 60 yards as the trail bends left (south), ignore another trail cutting hard right (this is Old Zoo Trail). Looking northeast from Fern Canyon Trail toward Glendale. 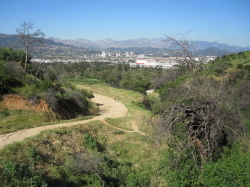 At 1.0 mile you reach 5-Points junction on a ridge with southern views opening up toward Downtown L.A. The route directly in front of you is Coolidge Trail, your return route. The two routes on your right head east toward Vista Del Valle Drive. This makes a nice loop addition to your hike if you would like to add some mileage and great views west toward the observatory. But for now, turn left and follow the ridgeline road east toward Beacon Hill. Eucalyptus trees line your route. You have views both north and south as you descend gently to a saddle. Notice the path coming in from the left; this is the alternate north ridge route. The rounded summit of your destination rises before you. The final pitch to the summit is steep but brief. You arrive at Beacon Hill 1.25 miles from the start. Looking south from Beacon Hill toward the L.A. River and the I-5 Freeway. Views from Beacon Hill (1,001') are amazing, particularly on a clear day. 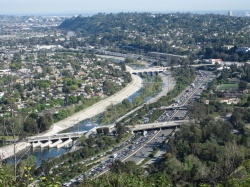 Immediately in front of you runs the Golden State I-5 freeway and Los Angeles River, which sometimes runs faster than the traffic on the freeway. Glendale sprawls out in front of you to the east, with Eagle Rock in the distance. Can you spot the eagle rock? Burbank highlights your northern view with Verdugo Hills rising high behind it. The San Gabriel Mountains outlines your northeast skyline. To the south you'll spot Silver Lake, downtown Los Angeles, and when the weather is clear, you can see all the way out to Pales Verdes Peninsula and Catalina Island. Hogback ridge defines your western skyline. If you look carefully northwest, you can spot Bee Rock adorning the mountainside. To the south, there is a use path that directly descends the ridge to meet Lower Beacon Trail. This is an alternative route you can use, but note that it is somewhat steep in the upper portion with some loose footing). After you have thoroughly soaked in the scenery atop Beacon Hill, retrace your steps to 5-Points junction. To continue on the loop, turn left (south) and begin your decent on Coolidge Trail. You contour along in a southward direction to the very southeast corner of the park. You can see your route far below you. In a bit you'll have a nice look at Beacon Hill looming on the north. As you near Marty Tregnan Golf Academy, you'll navigate a hairpin turn and start back home. After you pass the fence of the driving range, you encounter a fork in the trial. To the right is an access trail coming up from a trailhead on Crystal Springs Drive near the pony and train ride. Veer left and continue ascending. Another hairpin will have you heading back southeast and in a couple minutes you achieve an ascending/descending ridge with good views east and south. There is a use path that directly ascends this ridge to the summit of Beacon Hill (this is an alternative route you can use. It starts off gently and gets somewhat steep with some loose footing as it approaches the summit). Continue north, now descending. The trail traverses along the east flank of Beacon Hill paralleling the noisy freeway. Shortly, the trail will begin to bend west with a steep climb. Views open up north and your final destination will come into view. You begin to descend and in a few minutes you arrive at the trailhead with a post marked with a "2." Walk across the street to the parking lot. North approach - A climber's path ascends 0.35 mile from Lower Beacon Trail to Upper Beacon Trail, offering a more rustic and direct route than the hike up Fern Canyon Trail, saving about 1 mile. It's not shown on the LaBonge map but is on Hileman's map (1986) and the map I provide below (a modified LaBonge map). To take this route, begin from the large parking lot near the merry-go-round and walk back south to the entrance of the lot (where a barrier blocks the road). Rather than turning right (west), as in the hike above, you directly cross the street to Lower Beacon Trail (a post on the left of the trail indicates "2"). Walk southeast on this dirt road and in about 0.1 mile you reach an outward bend. Notice the narrow path climbing the slope on the right. This is your route. It's steeper than the usual trails in the park but not bad. It climbs south on the broad ridge with views east and west and over your shoulder to the north. After gaining 420 vertical feet, the trail meets Upper Beacon Trail (dirt road). Turn left (east) and in about 40 yards you'll begin the steep but brief climb to the summit of Beacon Hill, 0.56 mile from the start. If you would like to add an additional loop that will increase your hike by 1.0 mile, here's a nice option: From 5-Points junction, notice two trails heading west. Take the one on the left which climbs southwest about 0.25 mile to Joe Klass Water Stop, which sits on an outward hairpin bend of Vista Del Valle Drive. Here you will find some picnic tables, water, trash cans, hitching rails, and shade. Veer right on the paved road as it heads west, ascending. In about 0.25 mile the road takes a sweeping right turn (north) with a large paved turnoutVista View Pointoffering great views south toward the L.A. skyline and west toward Griffith Observatory. About 100 yards further, the road intersects Riverside Trail coming up from the west. Here is also the beginning of Hogback Trail (AKA East Ridge Trail or Bridle Trail) climbing northwest past Glendale Peak to Mt. Hollywood about 1.0 mile away. For your return, take the wide dirt path adjacent to the large paved turn out. You will ascend momentarily, bear left, then begin descending north along the west of the small summit with the water tank. You will bend right and follow the trail contouring through the upper reaches of Fern Canyon in a northeasterly direction and descend to 5-Points junction. To complete the full Beacon Hill loop as described above, turn right (south) and descend via Cooledge Trail. Or you can turn left at 5-Points and descend the way you came up via Fern Canyon Trail. Griffith Park - Official Website. Virtually useless for hikersno maps, trail descriptions or any anything that provides a clue to where or how to hike in the park. Day Hikes Around Los Angeles - by Robert Stone (Day Hikes Books: Red Lodge, 2003). Hike 70: "Beacon Hill." Brief historical background and trail description of a 4.0-mile loop hike with 550 feet in gain ascending Fern Canyon Trail and descending Coolidge Trail and Lower Beacon Trail (or 2.5 miles out and back). His description of the beginning of the hike is vague and confusing. His elevation gain does not take into account for some rollercoaster action. 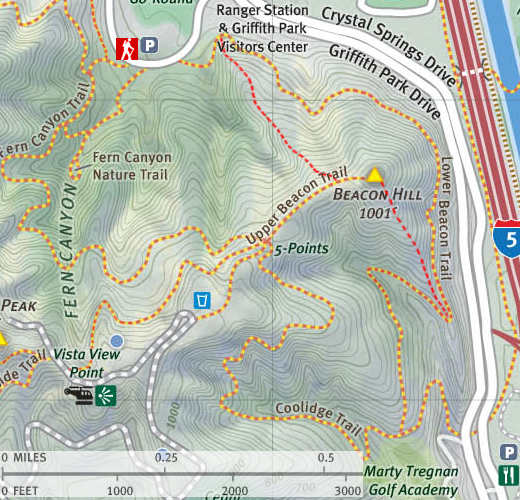 His line map is accurate and helpful except for beginning the hike. He has corrected these issues in his 2012 book (see below). 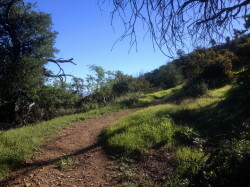 Day Hikes in the Santa Monica Mountains - by Robert Stone (Day Hikes Books: Red Lodge, 2012). Hike 1: "Beacon Hill Loop." Brief historical background and trail description of a 5.0-mile double loop hike with 650 feet in gain ascending Fern Canyon Trail and descending Coolidge Trail and Lower Beacon. He has corrected the problems that are in the 2003 book (above) and his description and line map are now accurate and reliable. Los Angeles County: A Day Hiker's Guide - by John McKinney (The Trailmaster: Santa Barbara, 2006). "Beacon Hill." Good historical background and trail description of the 4-mile loop with 600 feet in gain. His description of the beginning of the hike is a bit vague but better than Stone's 2003 book. Typical of McKinney's work, his colorful writing style makes enjoyable reading. Afoot and Afield in Los Angeles County - by Jerry Schad (Wilderness Press: Berkley, 2000). Area B-6, Trip 2: "Beacon Hill." Brief historical background and a trail description of a 1.9-mile hike ascending the north ridge (beginning 0.1 mile up Lower Beacon Trail) to intersect Upper Beacon Trail just west of the summit, then returns via Fern Canyon Trail. This page was last updated February 18, 2016.